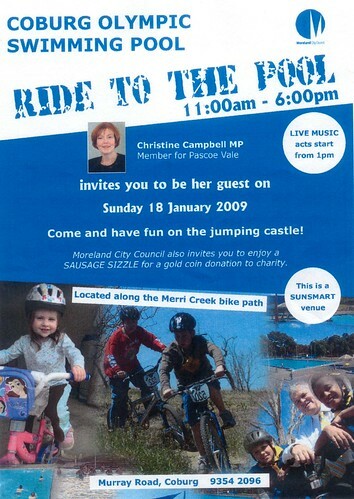 This Sunday, the 18th of January 2009, there's a special Ride to the Pool Day to celebrate the re-opening of the Coburg Olympic Pool and it's special location along the Merri Creek bike path. People are encouraged to cycle to the pool and park out the front. Enjoy free entry as the guest of Christine Campbell MP (Member for Pascoe Vale). Swim in the sparkling waters of the pool, laze under shady trees and listen to a feast of live music. Jump on the jumping castle, eat sausages at the Moreland City Council sausage sizzle (gold coin to charity). There will also be a Friends Of Coburg Olympic Pool table where you can come and have a chat or maybe purchase a tee-shirt or bag. The weather looks like it's going to be good, at this stage the forecast is for 28C... perfect for hanging out at the pool.